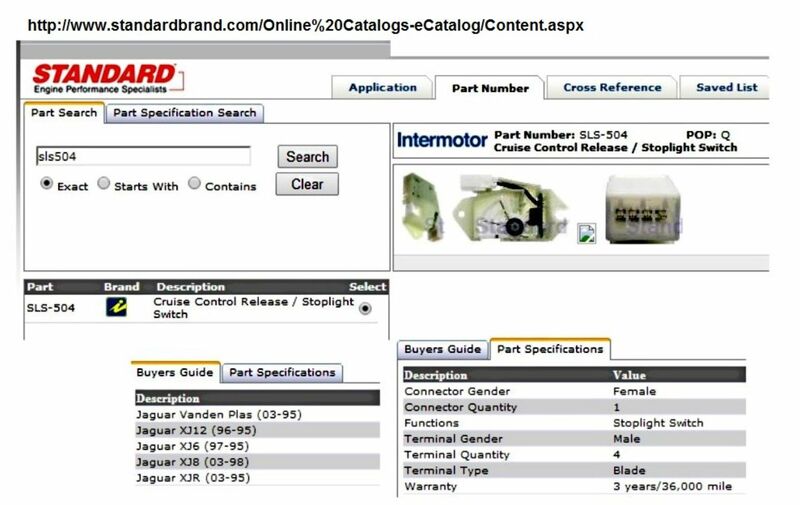 website it is of the XJ8 switch with the right Jaguar model number right on it. I called rock auto and they said there pics are right. If that is true the parts are mixed up. if its wrong they are at fault and will exchange it. I removed mine from an XJ8 pedal assembly and IIRC that the top one is a locating pin so if you feel up there you should find it directly above the lower stud. Jim are you wanting to know how the switch assembly fits? It only goes in one way in a fixed position to receive the black attached stud. Have you tried cleaning/replacing the micro switches? 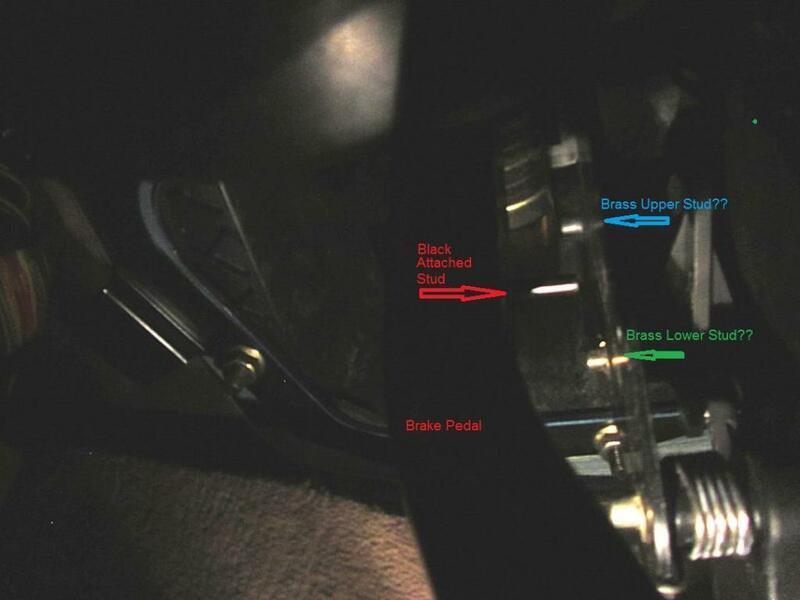 The black attached stud is how the brake pedal actuates teh switch (it is actuated when the pin is NOT touching the switch) I found this to be counter intuitive but is how it works. I suppose that eliminates the need to adjust? 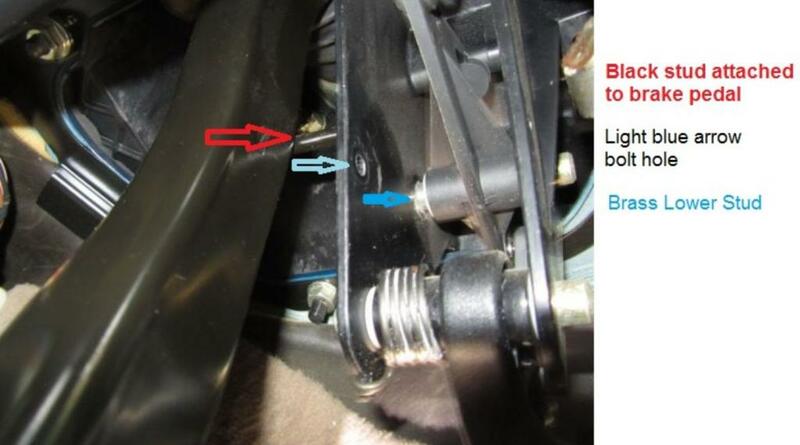 The brass upper stud highlighted in blue in your second picture is likely the correct one for the slot in the switch. 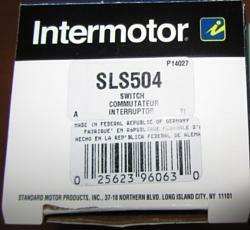 I purchased a new brake switch for $45.79 less promo of $2.29 (5% discount) but added 3 day ups express $17.79 - totaled $61.29 from Rock Auto Parts - part# is SLS504 mfg by STANDARD MOTOR PRODUCTS - shipped from standard motor products warehouse in Richmond Va. Received it in 2 days from the order date. The mounting bolt has a 7mm head and a 8mm lock nut. This evening I ordered Gear Wrench 7 mm Ratcheting Combination Wrench from Advanced Auto Parts online for net price of $7.43 that is in stock at my local store and is being held there for me to pick it tomorrow. List price was $9.99 less promo code TRT30 (30% discount = $3.00) plus sales tax. I purchased an Irwin vise grip long reach (6LN) - nice thin long needle nose lock gripping piers at Lowes for $7.99 to hold the lock nut when I install the new switch. Last edited by jimlombardi; 01-30-2014 at 07:26 PM. Rock Auto Parts still has Airtex part# SW9225 in stock for $45.99 (5% rock auto promo code- 127145206330085) probably net cost after discount and shipping of about $57. Last edited by jimlombardi; 01-30-2014 at 05:55 PM. 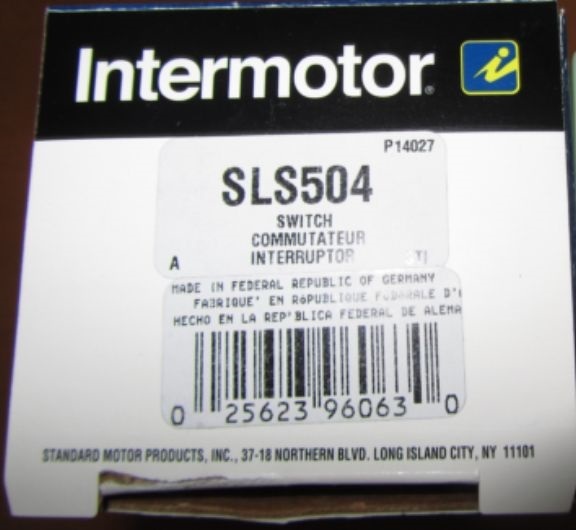 Rock Auto parts photo of the switch is not the one for part# SLS504 (it is for the part# SLS503 for the 1997 - 2006 XK8 & 2000 -2006 XKR). Rock Auto parts has the wrong photos for these 2 parts numbers - they need to switch the photos. 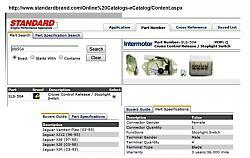 After the webpage opens, Click on the part number tab (to bring up the part number seach webpage) put SLS504 as the part number in the part number search box. Last edited by jimlombardi; 01-31-2014 at 07:26 AM. Thank you Jim! I appreciate it. Last edited by EyeDoc; 01-31-2014 at 09:03 AM. I just checked Rock Auto Parts webpage for the SLS504 brake switch for XJ and they now have it in stock also it now has the correct photo with it. They also now put the correct photo for the SLS503 brake switch for XK. Has anyone tried replacing the micro-switches (Cherry A817) that are inside the switch mechanism? It seems relatively easy to de-solder the old switches and replace with new ones. If so, where did you purchase them, and what was the cost? I think $125 for the OEM replacement is way out of line, especially since this should have been part of a recall since it poses a real safety issue. RC - I was interested in replacing the micro-switches but couldn't figure out which ones to get. There are thousands at Digi-Key for example. I just went looking for Cherry A817 or A8-17 and can't find them for sale either. The switches in my car (I had the switch assembly out to study it) - the steel lever is not hinged as shown by Cherry but is fixed and curves around the top to work the switch and is springy (hard to describe) - and I could not find a MFG name or numbers on them. Can you point me to a place that sells them? Rock Auto no longer has the SLS-503 for some years of the XK8 (I have a 2006). I was going to get one for my 2006 XK8 - put it in the cart and then a few seconds later a message jumped up indicating "no longer available removing from cart" and it disappeared from my cart and it disappeared from the online catalog, too. I found the Standard SLS-503 Switch at other places around $70 - much better than Jaguar's price so may go that route but would be happy to replace the switches if I can find them, as most micro-switches are under $1 each. Jimbov8 are you in the uk any time soon?? Sounds like I've got to replace the brake light switch and i'm not looking forward to it!! It's due for test end of march so firstly I need to get a switch then have a go at fitting it, any help much appreciated! Toshnali, you are posting in the XJ8 forum. You will get help more quickly by starting a new thread in the XK8 forum. Last edited by jimlombardi; 07-26-2016 at 07:37 AM. That's what I did a few years ago and it's worked for me.